Home Wellness	Eat the bread. I’ve been thinking a lot about negativity lately. Nothing has recently happened to us, but there is no shortage of pain, insecurity, and fear out there. It’s overwhelming and I find the older I get, the more guarded I have to be against all the pressures to accept negativity into my world. Every headline screams FEAR! PANIC! COMPARE! and if we are not careful, we get sucked right in. Real talk: I care what you think of me – probably way too much. For my entire life I have been a watcher. I am the youngest of three girls so I had the benefit of seeing two siblings grow up before my eyes. I knew the rules and I saw mistakes happen and I tried to absorb other people’s experiences as if they had happened to me so I could avoid disappointing others and ruining my permanent record. Oh yes, I said permanent record. In the 80s, life was all about that elusive checklist of right and wrong. I respected, even feared the record no one was keeping but myself. I became a slave to the record. Now that the internet is everywhere, there really is a permanent sort of record. But growing up, all I saw were reactions to actions and I based the type of person I would be on the way other people treated me as a result of my actions. I became an expert performer and to this day, I thrive on approval. Even though I know in my heart I am loved, I seek out reassurance daily. But real life? Real life is too short for performing. And let me be clear about something, no one is really watching that closely. Not me, not you. Are you keeping your house spotless because someone might drop in and “catch” you with dirty socks on the floor? Are you exercising so you can tweet or Instagram about it? Are you eating a salad because you are ashamed to get the cheeseburger you’ve been craving all week in front of your friends? If you are doing things for your own reasons, then great. But if your motivation is people pleasing? When the inner voice starts to tell you all the things you are doing wrong, argue with it. Remind that voice with the truth that you are loved no matter what other people say or think. Want to be silly? Do it. Laugh and throw your head back. Embrace the good things among the bad no matter how small or insignificant they seem. Accept love. You have to choose it. You have to let it in. Negativity has to knock too, you know. Be picky about answering the door to your heart, your one and only heart. YOU get to choose who and what to invite in. Choose love. 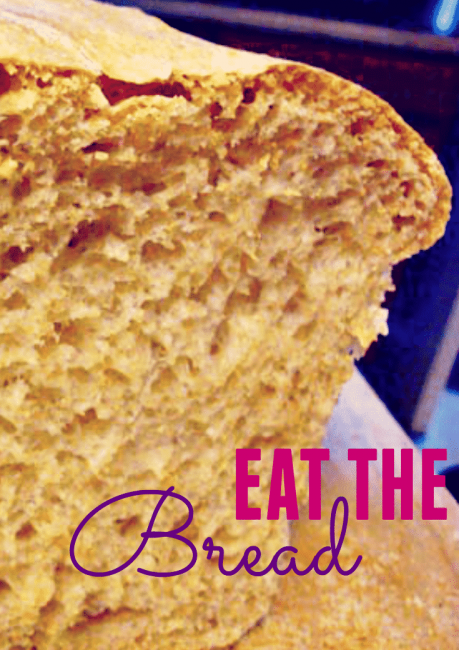 Eat the bread. Put your hair in a ponytail. Know that your performance or lack thereof doesn’t change a single thing about the fact that you are loved. Accepting love doesn’t magically change our circumstances. What is does, is allow us to put them into perspective. It gives us hope for tomorrow and the next day and the knowledge that the world will keep on spinning whether or not we are fabulous that day or wore makeup or ate the bread. I’m writing this down so I can read it tomorrow when I need to see it. And maybe again that afternoon. And then on Friday too. I’m writing it down and I will repeat it until my heart knows it is loved, until my heart remembers there is nothing I can do or undo to receive that love. The days when I choose love are so good. Funny how it happens that way. beautiful post, and beautiful thoughts.